Self-Absorbed Boomer: DH for the National League? Say it ain't so! DH for the National League? Say it ain't so! 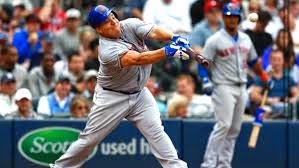 Do you want to deny Bartolo Colon (photo) the opportunity to repeat his two RBIs for the Mets so far this season? That's what lots of pundits argue for: make the National League conform to the American League rule that allows each team to have a designated hitter who substitutes for the pitcher in the batting order, thereby relieving the pitcher of any offensive duty. The arguments for the DH are: (1) increase scoring by eliminating an unproductive batter, and (2) speed up the game by eliminating pitcher changes when a pitcher has to be taken out for a pinch hitter, necessitating a warmup session for his substitute. However, it's been argued that the DH actually slows down games by allowing more intra-inning pitching changes, since these don't affect the batting lineup. My arguments against the DH are well documented here. I think it dumbs down the game in an effort to appeal to fans who want more scoring. The only major sport I can think of that has more scoring on a consistent basis is basketball. I haven't compared statistics, but I'd be willing to wager that scoring in NFL football is about as frequent, on the average, as in major league baseball, if we count only touchdowns and field goals and ignore the point after the TD. As for hockey and soccer, I think it's evident that scoring is less frequent than in baseball in both. With respect to speeding up the game, I'll confess to something idiosyncratic: I like regular breaks in the action that give me time to reflect on the situation, get a snack, chat with a friend, whatever. In any event, the evidence shows that the DH has little or no effect on game times. Besides, why must we assume that pitchers can't hit? Look at Bartolo Colon. Heck, look at Dwight Gooden back in the day, or Warren Spahn. Lots of pitchers--really good pitchers--can or could hit. TBT: Golden Earring, "Radar Love."